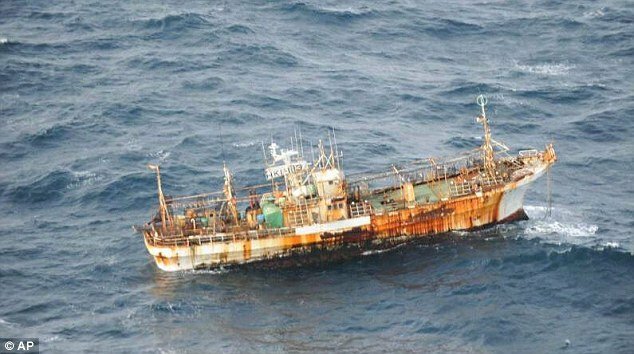 A Japanese fishing vessel swept away by the March 2011 tsunami has been spotted bobbing in the seas near British Columbia in western Canada. The trawler is part of the 5 million tons of debris that were swept into the ocean by the devastating tsunami when a magnitude-9.0 earthquake struck Japan. The 23ft wall of water struck the east coast of the island nation following a 9.0 earthquake, sweeping everything from cars to houses into the ocean leaving a wake of devastation. A Canadian military air patrol spotted the vessel – 4,703 miles away from where it was originally moored – floating towards the shore. It has been determined that the boat has been adrift without anybody at the helm since March 11 last year. The 50-foot-long (15-meter-long) vessel was recently about 160 miles (260 kilometers) west of Haida Gwaii, islands off the north-coast of British Columbia, slowly drifting toward shore. The Japan Coast Guard identified the owner of the fishing trawler after being contacted by Canadian officials, who were able to provide the identification number on the hull of the ship. The vessel, which was used for squid fishing, was moored at Hachinohe in the Aomori prefecture when the tsunami hit, said Toshiro Yoshinaga, a Coast Guard official. Canada’s transport ministry is monitoring the vessel for marine pollution and to see if it becomes an obstruction though there are no reports of leaks from the vessel. The tsunami last March generated more than 25 million tons of debris, say researchers at the University of Hawaii. Between four and eight million tons were washed into the ocean, with one to two million tons still floating on the surface. Maria Cantwell, US senator for Washington state, said the boat was expected to drift slowly south. “On its current trajectory and speed, the vessel wouldn’t make landfall for approximately 50 days,” Senator Maria Cantwell said in a statement. The earthquake, which struck about 230 miles northeast of Tokyo, was the largest in the country’s history. Thousands of people were killed when the earthquake triggered the tsunami and other giant waves that devastated cities and rural areas. According to the official toll, the disasters left 15,839 dead, 5,950 injured, and 3,642 missing.